Right, I owe you a birth story! Powerball was born at 9:36am on Monday, October 3rd in an unmedicated VBAC. He weighed 6 pounds 11 oz and was 20.5 inches. He has dark hair and long toes. He’s perfect. Late in the week before Powerball was born, some time on Thursday night I think, I started having occasional cramps. They were irregular, and low in my pelvis. It felt like Powerball was trying to bust his way out, but wasn’t quite sure what to do. I also wasn’t quite sure what to do, so took the sensible approach of ignoring what was going on. On Friday morning, as I dried off after my shower, most of my mucous plug came out. I was interested in a “bodies are fascinating” kind of way, but also had to get Bingo to daycare and didn’t have much time to over-analyze. Besides, a quick Google search told me that labour could still be hours, days, or weeks away– nothing I didn’t already know. So, again, I ignored what was going on. My only nod to the possibility of Powerball’s birth was switching my work calendar to October. Over the weekend I had more cramps and lost more of my mucous plug. The cramps were still irregular, and mostly background noise. I took Bingo to the park, went to an event downtown, and spent time with friends. Sea and I finally packed a hospital bag, but ignored the rest of our to do list. There was still time, we figured. I went to bed on Sunday night fully prepared to get up for work on Monday morning. Instead I woke up at 2am. It was mostly the cat’s fault. Sea’s cat (and, by default, mine) is an unfriendly animal, demonstrating his disdain for us by staying in whatever room we’re not in. The exception to this is in the middle of the night, when he is suddenly desperate for attention and spends hours walking across us and trying to eat our hair. It was his aggressive purring that first woke me up. Then, a cramp. The cat continued to purr. Another cramp. Sea rolled over and tried to push him off the bed. Another cramp. The cat batted at the back of my head, maybe noticing I wasn’t really asleep. Another cramp. Sea got up and kicked the cat out of the room. Another cramp. Sea went back to sleep, but I lay awake wondering if maybe– just maybe– I shouldn’t ignore what was happening. Another cramp contraction. I opened the contraction timer app that I had downloaded onto my phone the week before. I had felt ridiculous downloading it, certain that there wouldn’t be anything to time, but now I was using it to monitor contractions that were already between 7-10 minutes apart. It was 3am. I left Sea to sleep and went downstairs, still convinced that if I just walked around for awhile and drank some water the contractions would stop. Instead, they got closer together and stronger as I spent the next two hours silently walking my dark kitchen, holding the counter through contractions. By 5am I realized it was time to wake up Sea. Sea was surprisingly coherent for somebody who had been woken up at 2am by a cat and at 5am by a contracting partner. She asked if she should shower. Yes, I said, probably. She asked if she should call our two “on call” friends: one of them being Bingo’s babysitter, the other being The Doctor who we had asked to be there for the birth. Yes, I said, probably. She asked if I should page our midwife. Yes, I said, probably. So Sea showered, and I called the pager system used to wrangle our midwives. Between contractions (now less than five minutes apart), I gave my name and phone number and the person on the other end of the line promised that somebody would call me back within fifteen minutes. Fifteen minutes passed. Sea got out of the shower. Another fifteen minutes passed. Nobody called. Sea suggested we call again and I agreed, but told her that she would have to do it: I was going to throw up. While I threw up in the toilet, Sea paged again. Nobody called. I showered, finding relief until the hot water ran out. Sea paged again. Nobody called. I dressed, our friends arrived, and still nobody called. It was after 7am, it had been an hour and a half since we started trying to page a midwife, and my contractions were now between 3-4 minutes apart. Just as we decided that we were going to the hospital anyways, a deeply apologetic person called on behalf of the midwives clinic. Apparently the paging system wasn’t working, none of the midwives were answering, but somebody would meet us at the hospital. “Who?” Sea asked. They weren’t sure. But somebody. The Doctor drove us to the hospital, a four minute ride that lasted two contractions and approximately four million hours. As we pulled up to the hospital, I announced that I had to be let out of the car immediately so that I could throw up, which I did in the hospital’s neatly pruned flowerbed. After that glamorous arrival, we made our way up to the “family birthing centre” (standard labour and delivery unit) on the seventh floor. There was nobody at the reception desk, but a nurse on her way by told us to go directly down the hallway to triage. Unfortunately, triage seemed to be in the middle of a staff meeting. We stood in the hallway waiting and, between contractions, I eavesdropped on a litany of nurses’ complaints. The first was that a nurse, Norma, was always late– sauntering in for a 7:30 shift when it had already begun. The second was something to do with the process of wiping beds. The third was a demand by a particularly bossy nurse that nobody bother her that evening, because she would be at the Adele concert and not answering her phone. The fourth, and probably most pressing, was that all of the beds were full and nobody else could go into labour. Which is when Sea and I decided to let them know that– bed or not– we were there to have a baby. The Adele-loving nurse, unimpressed by our interruption, told us in no uncertain terms that we couldn’t have a baby until we had checked in at reception. So we went back down the hallway. A receptionist had materialized, but told us that we couldn’t check in until our midwife– or at least a midwife– had arrived but that there might be one already in triage. So we went back down the hallway. It occurred to me then that one of the (many) themes of Powerball’s birth was shaping up to be administrative failure. Thankfully, a midwife had just arrived. She was from the same clinic as our midwives, though we had never met her before. Apparently, the paging system had attempted to call any and every midwife, and she was the one who had answered first. Our own secondary midwife– Skim Milk– was also on her way. By the time I had changed into a hospital gown, Skim Milk was there and ready to check my progress. As the person in the next triage bed yelled, “ALLAH, ALLAH, ALLAH”, Skim Milk announced that I was already 5cm and fully effaced. She also told me that Powerball was still high in my pelvis, really high, and that a c-section might be necessary. “Okay.” I said. And, in that moment, I realized that it really was okay– that months of processing and worrying had made one of my birth intentions true. I wasn’t sad, disappointed, or angry in that moment. I trusted that Powerball was going to use whichever exit he had to and that, no matter what, we were going to be fine. We went down another hallway, one I had last walked almost three years ago when Bingo was born, to a delivery room– the very last one available, we were told. It was smaller and darker than the one where Bingo had been born, and had also been totally raided of supplies: everything from gauze to the computer mouse was missing. From the next room, we could hear somebody’s labour music playing– Celine Dion’s “My Heart Will Go On” on repeat. As I tried not to think of the Titanic, Skim Milk and the student midwife (who had just arrived) strapped wireless monitors around my contracting belly, explained that constant monitoring was a requirement of VBACs, and attempted to hook up an IV. With a new IV bag finally hooked up, I waited for the requisite half bag of fluid that I had to receive before I could have an epidural. Screw natural birth, I thought to myself. Natural birth is for people more natural than me. I would rather have a nap. During each contraction I would hold on to the bathroom door, bracing myself against the handle and swearing under my breath. Between contractions I would watch the painfully slow drip of the IV, just waiting for that half bag to be done. The OB checked my dilation before breaking my water to attach a scalp monitor to Powerball– I was now fully dilated, but Powerball was “sunny side up” with his nose pointed to my pelvis. As my water broke, meconium gushed everywhere. More people appeared in the room– nurses, two pediatricians, medical students. I only caught glimpses of them, mostly keeping my eyes tightly closed against the chaos. Then the bed was transformed around me, my legs lifted into stirrups: it was time to push. I pushed with each contraction, red faced and yelling. In between contractions, the OB reached inside of me and tried to manually turn Powerball who was stuck against my pelvic bone. This, friends, is undoubtedly the worst pain I’ve ever experienced– a stranger’s arm inside my contracting, exhausted body, trying to twist a baby unwilling to turn. “Stop, stop, stop,” I begged/yelled, but there was no stopping. Instead the OB told me that Powerball was going to need help to come out– maybe an episiotomy, maybe a vacuum, maybe forceps, maybe a c-section. I told her to do what she had to do, and kept pushing. The OB, who was brilliantly bossy, yelled at me to stop yelling and ignored me when I told her I couldn’t do this. Skim Milk and Sea stood by my shoulders, reassuring me and telling me that I was doing a good job. The rest of the people in the room all just became background noise. And then, in the two longest/hardest contractions ever, Powerball was out– lifted, squirming and filthy, onto my belly. He was only there for a moment before being handed off to the pediatricians and gaggle of medical students to be cleared of meconium, cleaned, and checked for any issues. As I delivered the placenta and had a second degree tear stitched up (they had never gotten to the episiotomy), Sea went to go and check on Powerball. She cut his cord, and shouted over from the corner of the room that he had hair. (Bingo was pretty bald, and we were expecting a repeat…) Then Powerball was delivered back to my chest, and a second of my birth intentions was realized: I held my baby. The room was suddenly very, very still. The doctors, nurses, and students had all disappeared. The Doctor had gone to buy us breakfast. It was only the midwives, Sea, Powerball, and me. Skim Milk and the midwife who had been the first to appear that morning, quietly filled out paperwork, checked Powerball, and marvelled over my placenta (which had, unbenownst to any of us, stopped functioning on one side at some point late in pregnancy). Sea and I stared at Powerball, tiny and bruised from birth, here. We were released from the hospital a couple of hours later. Twelve hours after I had been woken up by Sea’s cat, we were home, a new family of four. 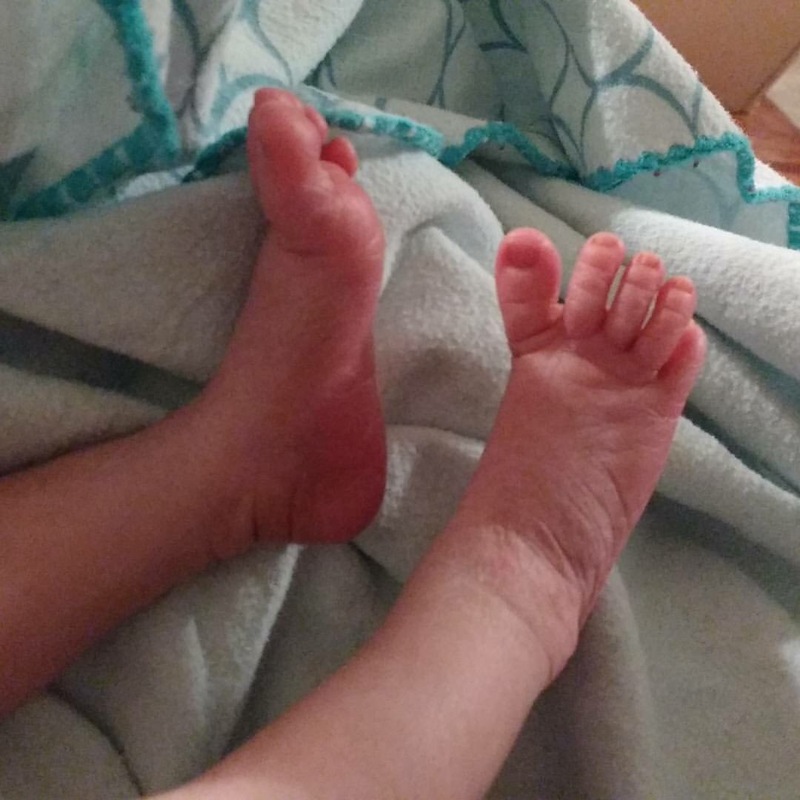 Baby feet, for making it all the way through. Somehow, Bingo is six months old. I want to write a post about her transformation from squishy newborn to funny, active little person, but right now I’m painfully aware of both my overall failure to blog and my specific failure to blog about Bingo’s birth. I’ll begin with the latter in an attempt to remedy the former. Still following? Good! After the contractions brought about by induction #1– cervical gel- tapered off, induction #2- pitocin- went ahead as scheduled, beginning on November 21st. Labor was long, painful, and scary at times. It culminated in two hours of pushing, followed by a caesarean after I spiked a fever and labor stalled. Of course, what it really culminated in was the birth of the fabulous Bingo. This end product- and the care/love of Sea, our friends, and our fabulous midwives- make this a happy story, even though, at the time, a lot of it felt like anything but. And here is the long version, written on November 21st and 22nd, 2013.